There is a new Michigan bill, HB 4006 that would allow the police to find your location from your cell phone provider without first obtaining a warrant. It is proposed for emergency situations to protect victims of crime, but be careful. When the police can get any information about you without a first presenting their reasons to a Judge or Magistrate, our privacy rights are at risk. Of course there are emergency situations that give credence to go around our long standing and constitutional rights to be free from illegal searches and seizures, but those are limited and specifically defined. The question is: Should we now legislate another way around our constitutional protections? Police officers have to get search warrants after swearing to the facts supporting the warrant to an impartial Magistrate. It happens every day and yes it takes more time for the police. This law allows the police to forgo that step and get anyone’s location from the cell phone provider if the police feel it is an emergency. Is this too much subjective power to give the police? Does this put victims of crime at risk because the police were delayed in getting the victim’s location? We have to way the benefits of protecting victims of crime against our personal rights. Victims have rights. We as citizens have rights. Let’s try to protect us both. What Most Lawyers Won’t Tell you…Use Uber! Lawyers hate giving advice to the general public. They feel anxious about generalizations about the law, because people might rely on their advice without consulting them first. When it comes to drunk driving in Michigan. I don’t care if you are a client or I never met you in the past. I will advise you on how to avoid get a drunk driving conviction without having to hire a lawyer. Guaranteed! There, I said it. When ever you are out drinking with friends and family and you want a guarantee not to get arrested for a OWI or any other drinking related offense, don’t take your drink in your car and don’t drive home. Call a friend or Uber instead. While I will always protect you if you get arrested, I would rather you be SAFE first. It is not against the law to drink and drive. It is against the law to be impaired or intoxicated due to the consumption of alcohol. In Michigan, a blood alcohol concentration (BAC) of .08 or greater is the level at which a driver is considered legally intoxicated. According to MADD, drunken driving fatalities with a .08 BAC or higher represented 28 percent (259) of all total traffic deaths in Michigan in 2012. There was a total of 5,471 alcohol-related crash injuries and 10,014 alcohol-related crashes in which the BAC was .01 or higher. Every single one of these could have been avoided if the driver called a friend to drive them or Uber to pick them up. Predictably, driving danger is higher than average during holiday periods. The U.S. National Institute on Alcohol Abuse and Alcoholism reports that 40 percent of traffic-related deaths during Christmas and New Year’s involve drunk drivers. The facts are grim: in December, 2012 nationwide there were 830 people killed in crashes involving at least one driver or motorcycle operator with a BAC of .08 or higher; 26 of those deaths occurred on Christmas Day. On average, a third (31 percent) of all crash fatalities in America involves drunken driving. But on Christmas day 2012, the percentage jumped to 36 percent. No stats on this year yet. ” Do you feel ok to drive?” Because that is not the criteria. The real question should be, “How much have you had to drink?” And if you are not satisfied with the answer, then you should take control and get them a ride. Even if you have to bring someone else into the picture to save your friend from possibly getting arrested for drunk driving, or worse, an accident that could ruin their lives. Or even another person’s life. After having prosecuted and defended 1,000’s of people charged with drunk driving, I can share some advice. I have never heard a client say that they would have rather gotten arrested for drunk driving, instead of making a simple phone call for a friend or now a press of a button and magic, Uber can be there. The average person lives just 10 miles from where they are drinking and Uber will take you home for less than $15. Of course all of us make mistakes in our lives, but we can try to protect ourselves against drunk driving arrests and convictions. If you are in trouble call me. I would rather talk to you BEFORE you need me to get you out of jail. Either way call for any advice. What do I need to know about the Driver Responsibility Fee Law? The Driver Responsibility Fee (DRF) law has been amended by Public Act 283 of 2014 to allow you to perform community service in place of paying certain Driver Responsibility fees. Beginning Jan. 1, 2015, you can complete 10 hours of community service for each qualifying violation. If you were ticketed for No Proof of Insurance, No Insurance, Driving without a Proper License/Endorsement/Vehicle Group Designator, Driving while License Expired, or Driving while Unlicensed or License Not Valid between October 1, 2003 and Oct. 1, 2012, you may qualify for this new program. The Michigan Department of Treasury will begin accepting applications for community service in January. Can I make arrangements to do community service as an alternative to paying my DRF? It depends on what types of violations are on your driving record; not all DRF offenses will qualify for the community service program. If you are eligible for the program, you will be contacted through the mail by Treasury beginning in December 2014. Which DRF offenses qualify to be waived by completing community service? How will I be notified if I am eligible to do community service as an alternative to paying my DRF? If you are eligible, you will be mailed one written notification to the address Treasury has on file for you. How long do I have to complete my community service? You will be given 45 days to complete your 10 hours of community service. If you have more than one qualifying offense on your driving record, you can decide to do your 10 hours of community service in blocks of 45 days each or group them all into one 45-day period. Any community service application forms submitted after December 31, 2015 will not be counted. If you have questions please contact Attorney Scott Weinberg. Speed Limit to 80 proposed. Good Idea? LANSING, Mich. (WXYZ) – A new bill introduced in the Michigan House of Representatives would raise the speed limit to 80 mph on some Michigan roads. House Bill 5964, introduced and sponsored by Rep. Brad Jacobson of Oakland County, intends to amend section 627 of Michigan Compiled Law 257.627 on speed limitations. By rural limited access freeway, Jacobson writes it means a freeway segment that has been designated by the State Transportation Department and the Department of State Police to be rural in nature. It also raises the speed limit for trucks operating on limited access freeways. It says anyone operating a school bus, bus or truck weighing 10,000 pounds or more, including semi-trailers, cannot go faster than 70 mph. 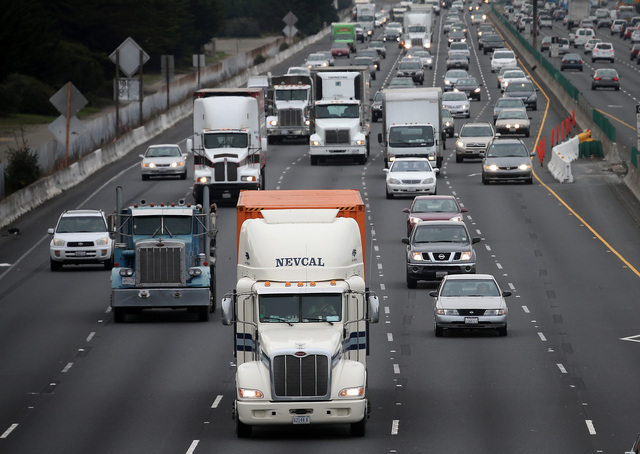 Right now, trucks can’t go faster than 60 mph. Construction speed limits are another issue on the bill. Right now, the speed limit cannot exceed 45 mph on a highway in a construction zone. Jacobson’s bill says the speed limit on a highway during construction may be decreased by no more than 10 mph than it’s normal speed limit. The bill also says it cannot be slower than 30 mph in general. Another portion of the bill deals with speed limits on dirt and gravel roads without a posted limit. He says the speed should be 55 mph if a speed is not posted, but should go down to 45 mph if the road is in a town with a population of more than 1 million people. The bill was introduced and read for the first time on Nov. 13. It was also referred to the Committee on Transportation and Infrastructure. It’s expected to be taken up by the House during their next session in December. With last week’s action by Obama that expanded the deferred action program and added millions of other immigrants, Avila’s plight highlights a harsh reality about the president’s changes. The president may be allowing them to remain in the U.S., but it doesn’t mean their state will let them drive a car, get an education at an affordable rate or obtain health insurance. A patchwork of rules began to form in states – largely along political lines – after the president allowed some young immigrants to stay in the country. Conservative states like Nebraska and Arizona kept them from getting driver’s licenses while liberal locations were much more welcoming in terms of state services and benefits. Now, states must make new decisions on how to respond to the president’s action that allows millions more immigrants to remain in the U.S. In California, Democrats, immigration groups and health care advocates are pushing for the immigrants to receive health care under the state’s version of the Medicaid program. The California Department of Health Care Services is deciding how to proceed. The president’s action excludes immigrants who came to the country illegally from qualifying for federal health benefits. In Nevada, officials are drawing up a bill for the Legislature making clear that unauthorized immigrants can become teachers in the state. Current rules specify that a prospective teacher must be a U.S. citizen or lawful permanent resident before they can receive a teaching license in Nevada. A new gubernatorial administration in Arizona will have to decide whether to continue a hard-line approach toward state benefits that outgoing Gov. Jan Brewer took. After Obama took action in 2012 granting legal status to 1.8 million young people brought to the U.S. as children, Brewer issued an executive order denying them driver’s licenses or other state benefits, including in-state tuition at the state’s public universities. A federal appeals court ruled the license ban was unconstitutional, and Brewer is considering an appeal to the U.S. Supreme Court. “Our position is unilateral action by the president does nothing to change the fact that an illegal alien’s presence is the United States is not authorized under federal law,” Brewer spokesman Andrew Wilder said. Arizona’s Republican Governor-elect, Doug Ducey, has said he intends to continue Brewer’s current ban, if it survives court challenges. Maryland’s Democratic governor, Martin O’Malley, has taken a decidedly different tack. He’s a supporter of state laws granting in-state tuition to people without legal status and grants them driver’s licenses. He has even been willing to get into a policy fight with Obama on the stream of unaccompanied immigrant children from Central America over the Mexican border, criticizing the White House proposal earlier this year that could have expedited the deportation of the children. Arizona remains an outlier in its treatment of immigrants granted work permits and is among the most harsh when it comes to those who remain in the U.S. without legal authorization. States surrounding Arizona provide in-state tuition to all residents, regardless of immigration status. And in January, California joins nine other states in allowing immigrants who can’t prove they’re in the U.S legally to get a driver’s license. Utah provides leniency when it comes to driving privileges and education, despite passing a law in 2011 that mirrored Arizona’s landmark immigration crackdown, SB1070. The state issues driving-privilege cards that must be renewed annually for those who cannot prove they’re in the country legally. Nearly 36,300 were issued last year, said Nannette Rolfe, the director of Utah’s Driver License Division. Utah also offers in-state tuition at public universities and colleges to residents not in the U.S. legally. To be eligible, students must have attended a Utah high school for at least three years and earned a diploma or GED. They can’t hold a non-immigrant visa and must file an application to legalize their immigration status when eligible to do so. In the 2012-2013 academic students, 929 students took advantage of the program. Despite the fact that life would be easier if he left the state, Avila said he’s staying put. AP reporters Judy Lin in Sacramento, California, Michelle Price in Salt Lake City, Michelle Rindels in Las Vegas and Brian Witte in Annapolis, Maryland contributed to this report. Would Jail Time For First Time DUI Offenders Act As A Deterrent For Future Offenses? In Michigan drivers face a mandatory driver license suspension of six months for a first time conviction of drunk or drugged driving. Although it is possible for a first time offender to get jail time, it is not likely. However, a one year mandatory driver license suspension is imposed upon a first time offender of a “High BAC” crime. This is a situation where the driver had a blood alcohol content of .17 or higher. There is a driver license reinstatement fee of $125 for a suspension and a Driver Responsibility Fee of $1,000 for two consecutive years a driving while intoxicated conviction. According to the U.S. Department of Transportation’s National Highway Traffic Safety Administration, intoxicated drivers with previous DUI convictions are four times more likely to be involved in a fatal accident than an intoxicated driver who had no prior DUIs. Furthermore, one third of all those arrested for DUI are repeat offenders and one out of eight intoxicated drivers involved in fatal accidents had at least one DUI conviction in the previous three years. Unfortunately, the probability of a fatal accident is directly proportionate to the number of previous DUI arrests. The serious nature of driving under the influence is beyond debate. However, there is a litany of opinions relating to the pros and cons of jail time for first time DUI offenders as a deterrent to future offenses. And, the debate goes on. Many feel that incarceration will cause individuals to more seriously consider getting behind the wheel after drinking because of fear of going to jail, the stigma attached, the humiliation and potential effect on employment. Others argue that social drinking and a momentary lapse in judgment should not be sufficient cause for an individual to go to jail for a first time DUI arrest. The question is, “would mandatory jail time for first time DUI offenders serve to deter driving under the influence in the future?” As is the case in most situations voicing the pros and cons of any debated topic, there is basically a 50/50 split on whether jail time would act as a deterrent. I believe that it won’t. As an experienced criminal attorney in Michigan, I have seen situations time and again where people have gotten behind the wheel to drive after having had too much to drink. Many are repeat offenders. They know full well that they are impaired, but they do it anyway, without considering the consequences. Why should we believe that mandatory jail time for first offenders would act to deter them in the future? If you or someone you know has been arrested for DUI, the consequences can be as harsh as time in prison for repeat offenders. Scott Weinberg is a seasoned criminal attorney who has represented Michigan residents with DUIs and other matters for the last 25 years. Not only has he had his own show, “Weinberg On The Law,” he also served as an expert commentator on Court TV and CBS Radio. Please contact us to schedule a confidential consultation to discuss your case and the options available to you. Plymouth-based Humanetics has introduced a new obese dummy to reflect American’s growing size. 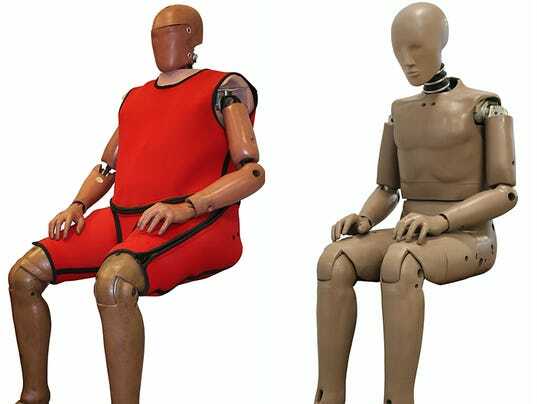 The 273-pound dummy — an anthropomorphic test device — is 106 pounds heavier than the traditional model. The new crash test dummy weights 106 pounds and five inches taller than the traditional model. Nearly 35% of American adults are obese, according to the CDC. Obese drivers are up to 78% more likely to die in car crashes, a study found. 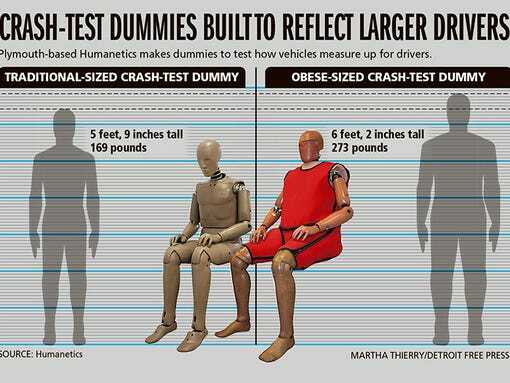 Americans are getting fatter — and so are the crash test dummies used to test the cars they drive. Plymouth-based Humanetics has introduced a new obese dummy to reflect American’s growing size. The 273-pound dummy — officially called an anthropomorphic test device — is 106 pounds heavier than the traditional model, reflecting public health trends. According to the Centers for Disease Control and Prevention, 34.9% of American adults — an estimated 78.6 million people — are obese and Humanetics President and CEO Chris O’Connor explained that how they fit in the seat, how their different centers of gravity could translate into car crash injuries, how seat belts and air bags work on them, and are different enough to warrant a new dummy body type. A University of California-Berkeley study, published in 2013, found that obese drivers are up to 78% more likely to die in car crashes. Around since the 1980s, the traditional crash test dummy is often seen in car commercials to vividly show a vehicle’s safety level, but perhaps are best known by the talking crash test dummies in the Ad Council ads, which say: “You can learn a lot from a dummy,” starring the dummies Vince and Larry. Note that the new obese model is also 5 inches taller than the more commonly-used 5-foot-9 version. It costs the same amount as the normal-weight dummy — $500,000 — and according to O’Connor, can be reused for decades. Humanetics, believed to be the only designer and manufacturer of crash test dummies in the U.S., was founded in 1952 to make what were then called mannequins to test airplane ejector seats, but added car crash test dummies in the 1960s, according to O’Connor. Today, it has 500 employees, supplies OEMs, Tier 1 safety suppliers, government agencies and medical researchers and has an estimated $125 million in annual sales. Fatbodypolitics.com founder Amanda Levitt applauds Humanetics’ product expansion. However, the Insurance Institute for Highway Safety has no plans to incorporate the obese dummy into its testing program. The Detroit Three don’t seem poised to make any changes, either. “We are studying the modification made to an average male anthropomorphic test size to increase its mass and will evaluate the effects of the modifications when it becomes available. In the meantime, we look forward to the test results,” said Chrysler spokesman Nick Cappa. The obese model goes on sale early next year. “GM is committed to the development and application of the best safety technologies and test devices to ensure the protection of all occupants. To stay on the leading edge of vehicle safety testing, we constantly evaluate new trends and devices that may help us design our cars and trucks to deliver the highest levels of safety for our customers,” spokesman Klaus-Peter Martin said. He declined to say if GM plans to buy this type of dummy. Michigan Driver’s Responsibility Fees Slashed !!! points on his or her driving record. individual who accumulates seven or more points. receives a ticket for qualifying offenses. The bottom line is that this “tax” on our ability to drive is going away…eventually! If you or a loved one is dealing with a driving issue or arrested on a Driving While License Suspended charge, DO NOT PLEAD GUILTY! There are many implications still waiting to effect your license. Call an attorney BEFORE you go to Court and get some good advice. There has never been any medical record of marijuana ever causing a single death in the United States. It also is well documented that cannabis helps provide patients suffering from HIV, MS, cancer, and other diseases, relief from the pain of their often deadly illnesses. This has been the cornerstone of the surge to legalize medical marijuana usage across the country. Seventeen states and the District of Columbia currently have laws legalizing marijuana for medical use. Among them is Michigan, which approved the “Michigan Medical Marihuana Act” on November 4, 2008. Michigan’s list of approved conditions for using medical marijuana include cancer, glaucoma, HIV, AIDS, hepatitis C, Crohn’s disease, Alzheimer’s and other specific medical conditions. Under the law, possession is limited to 2.5 ounces of usable marijuana and twelve plants that are in a locked and enclosed area. There is a $100 fee to obtain a new or renewal registration card for patients with the approved conditions. Medicaid patients only have to pay $25. Some of the other states that enacted laws legalizing marijuana for medicinal purposes include California, Colorado, Connecticut, Maine, Montana, Nevada, Oregon and Washington. The legalization of medical marijuana has resulted in the explosion of the number of dispensaries, especially in Colorado where there are more than 88,000 card carrying residents. California has also seen dramatic growth in the number of dispensaries sprouting up. The DEA feels that the decriminalization of marijuana for medicinal purposes has also resulted in opportunistic criminals becoming involved to use “dispensaries” as a store front for the distribution of marijuana. The DEA recently focused on 23 medical marijuana businesses that were operating within school zones in Washington. In California, the DEA and prosecutors continued their crackdown on medical marijuana dispensaries, where over 300 pot stores were targeted. Prosecutors there state that drug dealers and suppliers use the medical pot law as a legal way to operate open and obvious sophisticated drug-trafficking and money laundering businesses. The Los Angeles City Council has voted to shut down 900 dispensaries, as the businesses have spiraled out of control. The legalization of medical marijuana began as a good thing to benefit those patients that sorely needed relief from the symptoms of their painful diseases. Unfortunately, it has led to abuse by attempting to regulate something that such a large number of Americans use anyway. It is reminiscent of the federal governments failed Prohibition efforts in the 1920s to stop the sale and drinking of alcohol, which led to unregulated, untaxed bootleg whiskey, speakeasies, widespread organized crime and violence. Just like medicinal marijuana during Prohibition it was possible to get a prescription from a doctor for whiskey. Naturally, the number of patients seeking medicinal whiskey grew exponentially as well as the number of doctors who wrote the prescriptions and the growing number of drug stores that filled them without asking any questions. So is this allowing medical marihuana a good thing in the State of Michigan? Should we simply legalize it, regulate it, tax it and make it apart of our allowable social culture similar to alcohol? You decide. The fact is that partially legalizing a banned substance, such as marijuana, for limited use is fraught with temptation that can invariably lead to abuse. As a Michigan attorney who has been a prosecutor and a criminal defense lawyer for over 20 years, I feel that while the idea behind medical marijuana was justified and well intentioned, like Prohibition, it remains an open invitation for criminal organizations to take over. The only real solution is to legalize marijuana entirely, reap the economic benefits that go along with it, and remove organized crime from the equation. Contact us to schedule an appointment to discuss your situation. We do not make you pay your entire fee upfront and offer a variety of easy payment plans.